Island Ski Tours delivers ski-trip planning services to a variety of mountains in the northeast. Customers have the ability to access upcoming trips, snow reports, groups & schools, lessons, equipment information, and much more. Software Solutions incorporated responsive web design into the development of this site. Across all platforms and screen-sizes, the website will adapt to fit properly and provide a seamless user experience. This helps users stay on the company page longer, which means that there is a higher potential for an individual to become a new customer. 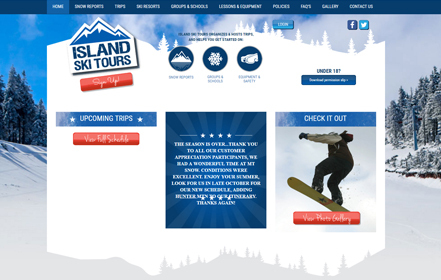 The site simplifies access to the many services offered by Island Ski Tours thanks to responsive web design. Users can easily sign-in to set up their ski trip and choose their rental equipment with the customer-facing portal that Software Solutions incorporated.